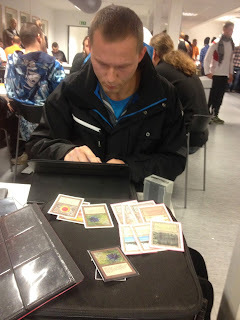 Roland bizing moxes, lotuses and duals (it was obviously more to the trade than the cards on the table here). Swamp, Lotus, Scavenging Ghoul, go. So, now my Project M deck has taken a leap forward, and few steps back. I don't have any moxes for the deck anymore, but I have the card that I though would be the by far most difficult to get my hands on. Moxes, schmoxes. High end "pre-alpha" cards, that is playtest cards. There were three editions of the playtest cards (alpha, beta and gamma; easy to mix up the names). I have no idea how much the asking price would be for the Starburst card I showed in my post about Time Walk, but I guess it would be stupid high. High end Summer Magic cards. In particular Serendib Efreet from Edgar is insanely expensive. High end Antiquites/Unlimited double sided test prints. Just crazy. Gorgeous! Truely an amazing trade, and the fact you know the cards history adds to it even more. 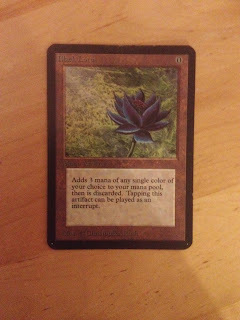 I've only recently started to get back into trading of true vintage cards from my childhood, your blog has been a true pleasure! nice that you showed the •High end Antiquites/Unlimited double sided test prints , cuz i diden´t know they existed. @Dave Thanks a lot for nice feedback! Best luck in your search of the old school cards!